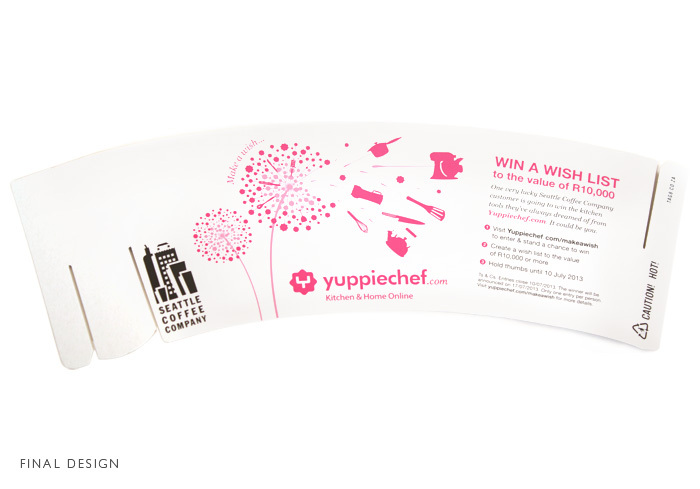 My time at Yuppiechef was extremely valuable in terms of what I learned and the people I had the privilege of working with. I had a great experience working on a variety of design from digital through to print production: I worked on the weekly newsletters, print advertisements, business cards, packaging (bags, boxes, product containers etc), digital marketing, posters and competitions. I helped with styling photography shoots and enjoyed conceptualising and doing research for various projects. Using the coffee sleeve as our canvas, we wanted to engage Seattle coffee drinkers in a competition where they could “Win their Wishlist” on Yuppiechef.com. After playing with a couple of concepts, we decided on a play on a classic method of making a wish: the dandelion.